Hi; I'm brand new, so I thought I'd ask this question. I belong to an SCA group, and I would like to do a Byzantine Army Officer during the 13th-14th Century. Can anyone tell me just what was the uniform of the Army to include the type of armor, helmets, swords, and shields? Also are there any pictures I could see that would give me an idea on how I should look? The Fourth Crusade inflicted irremediable damage on Byzantium, destroying virtually all institutional continuity, and utterly transforming the ideological outlook of the people. One area in which continuity was broken was in the military. The art of the Palaiologian era cannot be relied for realistic details of armour. The C13th was a desperate period with very little spare resources for high grade arms our. Lamellar had disappeared, so the answer is mail was the best they could do. In the fourteenth century they kept up with developments in the region as well as they could, adopting the composite mail and plate that was becoming more common. The mail and plate "mirror" armour was one the inspirations for the stylised radially patterned armours shown in late Byzantine icons. Helmats are a particular problem, because Byzantine religious art almost never shows them in any period, and in the late Byzantine period it is even worse. There is one C14th icon (St Merkourios) which shows a distorted kettle hat. Oddly, depictions of weapons and shields are more realistic than armour. 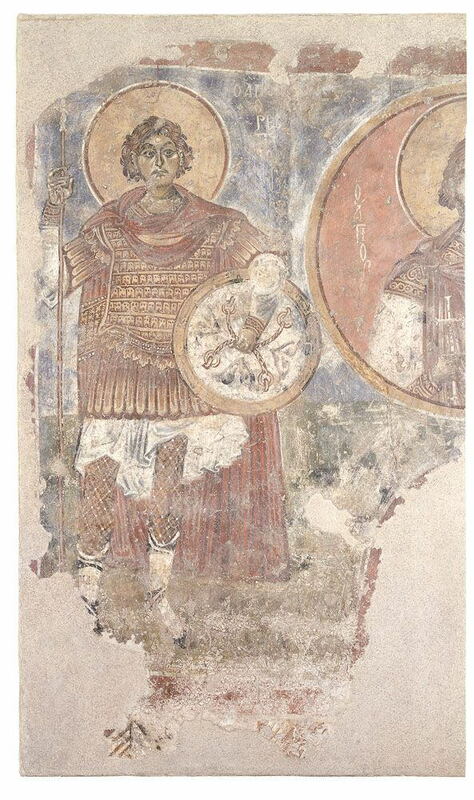 Look for pictures of the warrior saints in the Church of the Holy Saviour in Chora (Kariye Djami). Have a look at Andrea Babuine, 'Late Byzantine Arms and Armour', in David Nicolle (ed) Companion to Medieval Arms and Armour, Boydell & Brewer, London, 2002. But bear in mind that Andrea is a bit too trusting of the pictorial sources. Quote: The art of the Palaiologian era cannot be relied for realistic details of armour. The C13th was a desperate period with very little spare resources for high grade arms our. Lamellar had disappeared, so the answer is mail was the best they could do. This idea relies on the assumption that mail cost less than lamellar. It would be a pretty difficult proposition to support. Not all Art can be releied. There is truth in it. This reconstruction based on Paleopogian art was worn for 3 days in an archery contest and this contest was NOT static archery only but had "shoot and scoot" events. The armor was found to be comfortable and functional. Aphorism like "Art cannot be relied" are simply disproved by practical experimentation. Tricky period of history, but with a little determination you'll crack it. Dr. Timothy Dawson's main field of interest is c900 - 1204, but he represents an excellent starting point for anyone interested in Byzantine Military History. There you will find a large selection of images, a typology of swords and so on, and links to my site, I make primarily Byzantine reproduction swords. Would that be the same Timothy Dawson who commented on this very thread? When you say you make Bysantine period swords, do you have any pictures of ones you have made? I am assembling kit slowly for this period, and may be interested. Yes, the very same Dr. Timothy Dawson! He is a preeminent scholar of the Byzantine way of war. It was Tim who kindled my interest in the Romiosi. I'm working on Roman swords at the moment but just got a batch of blanks custom made for me I am going to be turning into Byzantine era swords, 16 of them. I don't custom orders to avoid creating queues I just sell swords as I make them. Happy to help in any way I can. New address for my thread regarding Byzantine Swords. It's now several hundred original images strong - all primary sources, no modern interpretations, all historical depictions and swords only ( no reproductions ). In the period native Byzantine styles of arms and armour seem to have declined in importance. The main influences on Byzantine warfare appear to have been Italian, on the one hand and Turco-Mongol on the other. While the images from the period are at least somewhat unreliable, there is a lot of contemporary stuff that sneaks in, and shows a change from earlier times. The most useful images are generally from later 13-th century and the 14th century. This is a very clear depiction of a high-ranking soldiers from the early 14-th century and probably the larger part of the 13-th. It is from Dechani monastery in Serbia and is from c 1320-40. It depicts St. Demetrious killing the bulgarian tsar Ioannis. What you're seeing is essentially a maille shirt covered by a surcoat (epilorikon?) Notice the maille hosen on the guy getting stabbed by st. Demetrious. Lamellar armour is also very often seen in the images and statues from all over the place, but it seems that it has declined in popularity. Unfortunately armour in the region survives rarely. The only lamellar finds from the XII-XIV century I'm aware of are from Serbia, while there are a bunch of them from 8-10 c.
It shows a maille or scale armour. And also please,please, please wear hosen and not pants as part of your civillian attire. It's what people in the region wore at that time, but a lot of groups seem to go for the pants route, which is unsupported by any evidence that I'm aware of. For more info on the arms and armour of the period also google "Arms and Armour of the Warrior Saints: Tradition and Innovation in Byzantine Iconography (843-1261)". Quote: In the period native Byzantine styles of arms and armour seem to have declined in importance. The main influences on Byzantine warfare appear to have been Italian, on the one hand and Turco-Mongol on the other. So is that a new trend? Republican helmets were Celtic, by the Tetrarchy they were Persian. Spatahe were also derived from germanic or Celtic examples, the gladius was from Spain I think? Clothing by the Tetrarchy was Egyption fashion, later we hear of Gothic, herulic and Persian items.. Anything new therefore? Urselius post=340864 Wrote: In the period native Byzantine styles of arms and armour seem to have declined in importance. The main influences on Byzantine warfare appear to have been Italian, on the one hand and Turco-Mongol on the other. Yes and no. Lamellar armour was of central Asian origins, as was, probably, splint armour for limbs. The Byzantines in the early Medieval period adopted these elements and managed to produce armour superficially resembling Classical muscle cuirasses and pteruges. In the later period this "Byzantinization" of appearance was much less pronounced, Byzantine light cavalry with khaftan-like tunics, Turkish bows and killic-like sabres were indistinguishable from their Turkish equivalents, Byzantine heavy cavalry, using imported Italian armour and weapons, were much the same, visually, as Italian medium-heavy cavalry. Byzantium had lost the cultural and manufacturing means to modify and particularise outside influences, they were just adopted wholesale.